You’re invited to join dedicated supporters who have contributed to the Canadian Ski Patrol’s mission for safer ski hills and events across Canada. Today, we’re encouraging you to consider becoming a Canadian Ski Patrol Summit Supporter. 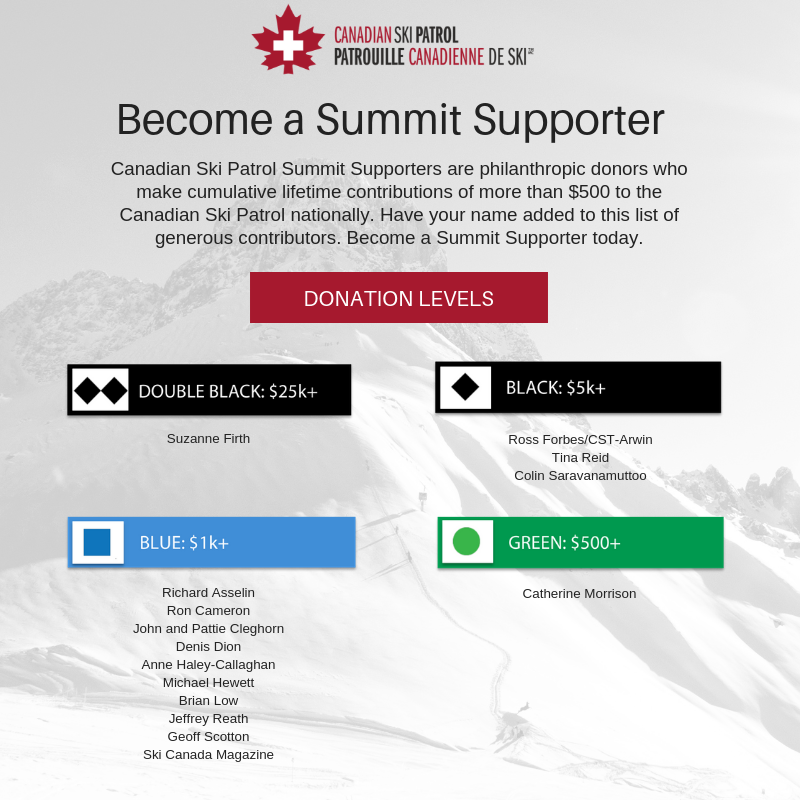 What is a Canadian Ski Patrol Summit Supporter? Canadian Ski Patrol Summit Supporters are generous donors who make cumulative lifetime contributions of $500 or more to the Canadian Ski Patrol nationally. A registered charity, we estimate our volunteers contribute a million hours a year to helping fellow Canadians. While our name reinforces our roots on the snow, patrollers continue to deliver first aid services even when they take off their skis and boards. Our volunteers are active off the snow, all across the country and throughout the year at sporting events, festivals and other community gatherings. Highly trained and mobile, this diverse group of skilled outdoor enthusiasts know what to do. They specialize in getting sick or injured people safely to the next level of care – no matter where they are located. By supporting the Canadian Ski Patrol, you will help ensure the long-term viability of our organization and improve the safety of ski hills and other events across Canada. Your gift will make Canada a better place and safer place to play, year round. Donations may be directed to specific projects, to operational needs or to the Canadian Ski Patrol Endowment Fund. Monthly donations are welcomed and a $100 monthly donation with a one-year pledge will be recognized as a Summit Supporter at the blue level. Charitable receipts will be issued by the Canadian Ski Patrol’s national office. Summit Supporters are leadership donors, and will be recognized on the Canadian Ski Patrol website, at our annual conference, and through a variety of channels, including social media. This entry was posted in 2018, Archive, March 2018, Member News, Public. Bookmark the permalink.